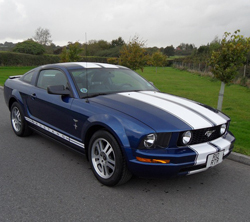 This is your opportunity to be chauffeur driven in a true American icon - A Ford Mustang! 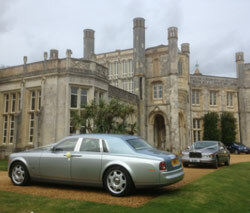 Our elegant Rolls Royce Phantom and Rolls Royce Silver Seraph at Highcliffe Castle on the 5th October 2012. 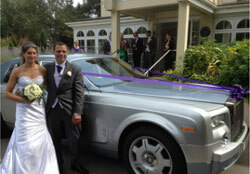 Then on to Careys Manor Hotel in Brockenhurst for the reception. 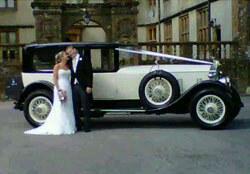 The 1929 Rolls Royce Phantom 1 and the Rolls Royce 20/25 1935 made an eye catching duo at the wedding of Gareth and Susan. 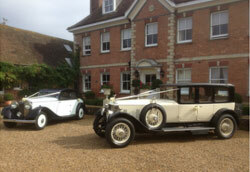 After staying and the amazing Captains Club in Christchurch the cars travelled on to Parley Manor for the ceremony and reception. 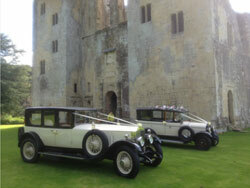 How great did our 1929 Rolls Royce Phantom 1 and our 1925 Chrysler Laundalette look at the wonderful Old Wardour Castle in Dorset for the elegant wedding of Alex and Rebecca. 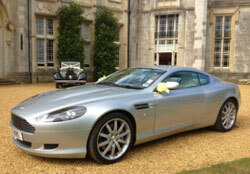 After the ceremony at the Castle, the cars travelled to Ashley Wood Farm in Tisbury for the reception. 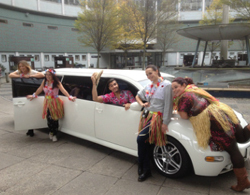 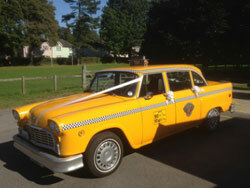 The amazing New York Checker Cab caused quite a stir at this lovely wedding near Salisbury. 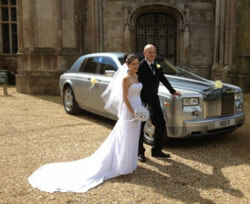 The photographer and the guests loved it and we have never seen so many people lining up to take photos. 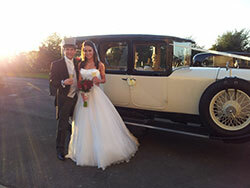 Congratulations Rebecca and Sam on their Marriage on 1st September 2012 at St Nicolas Church Silton, and then trvelling on in our Rolls Royce Phantom 1 (1929) to the wonderful Coppleridge Inn at Motcombe. 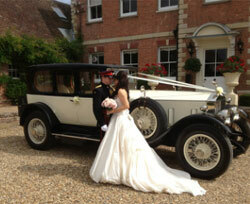 Congratulations to Emma and Jonathan. 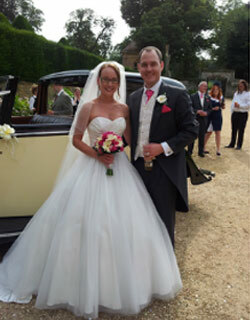 Married at St Peters Church in Shaftesbury on the 18th August 2012, then on to the magnificent Sherborne Castle for the reception. 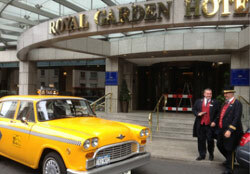 The car chosen was our 1929 Rolls Royce Phantom 1. 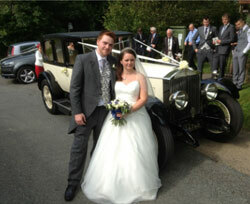 Congratulations to Tim and Katy who were married on the 17th August 2012. 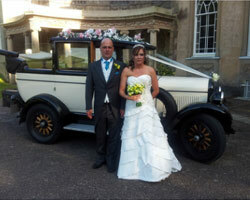 The transport chosen to take the couple from The East Close Hotel in Hinton to the magnificent Highcliffe Castle was our 1935 Rolls Royce 20/25 for the beautiful bride, and the Aston Martin DB9 for the dashing groom. 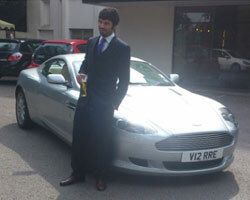 RR Elite was proud to display two of our cars including The Knight Rider KITT, at the annual Naomi House and Jacks Place summer charity fundraiser at Salisbury FC helping to raise funds for this local charity. 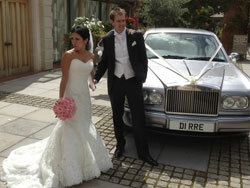 Married on the 4th August 2012 at The Queens Hotel in Southsea. 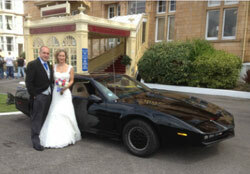 The Groom arriving in our Knight Rider KITT which was a surprise gift from his lovely bride.